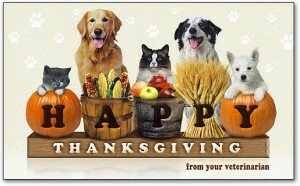 Turkey Day Tips For Pets! 1. It’s fine to let your dog join in on the Thanksgiving festivities with a small piece or two of turkey, but be sure that it is boneless, skinless white meat that is thoroughly cooked! Poultry bones can easily become lodged in your pets gastrointestinal track and fatty pieces of meat or skin can cause GI irritation. 2. Keep the raw dough out of Fido’s reach! The body heat of your pet can activate the yeast and make it rise in their stomach, which can very quickly lead to a medical emergency requiring surgery. 3. Stash the trash! We all know dogs and cats love to paw through the trash to see what goodies they can find. Be sure to safely dispose of food wrappers and containers. 4. With guests entering your home all day, it’s a great time to ensure that your pet is microchipped and the information is up to date! If Whiskers dashes out the door as Aunt Peggy comes inside, you want to be able to find her as quickly as possible. 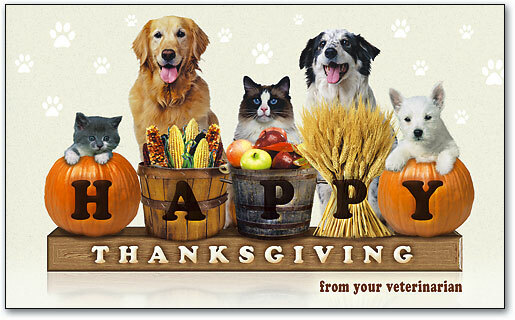 We hope these tips help you and your pets have a safe and happy Thanksgiving!